PRINCETON, N.J. -- Although still relatively low in an absolute sense, Americans' approval ratings of President Barack Obama's handling of the economy and foreign affairs are up significantly from last fall, to 43% and 36%, respectively. His ratings on these issues slumped last year, including a personal low of 31% for his handling of foreign affairs in November. The recent improvement in Obama's economy and foreign affairs approval ratings mirrors the trajectory of his overall job approval rating, which was 40% in Nov. 3-9 Gallup Daily tracking but was 47% in the latest weekly average, through Feb. 15. The increase has been aided by more positive economic news, including lower gas prices, which have boosted Americans' perceptions of the U.S. economy's health to the best they have been since the 2007-2009 recession. The more positive economic news may also explain why his economic approval rating has increased more (up 10 percentage points) than his foreign affairs approval rating (up five points) since November. While the economy is getting better, Obama continues to deal with a challenging international environment, including the Ukraine conflict, the Islamic State's presence in Iraq and Syria, as well as the ongoing threats of international terrorism, the Israeli-Palestinian conflict, and North Korea and Iran. As a result, his foreign affairs rating remains on the low side relative to his 2009-2013 ratings. Obama's economic approval ratings have not been above 50% since the honeymoon phase of his presidency in early 2009. As the economy continued to struggle through much of his presidency, his economic approval bottomed out at 26% in August 2011. It improved rather quickly to 45% by the time of his re-election in November 2012, but subsequently slumped again before the latest rebound. Obama has been rated higher for his handling of foreign affairs than for his handling of the economy for much of his presidency, but that has changed since mid-2013 in the context of the economic progress and significant international challenges facing the U.S.
Obama's overall approval rating has also generally exceeded his approval for handling both the economy and foreign affairs. This has been the most common pattern for presidents, but there have been many exceptions. Americans' more basic opinions of Obama -- apart from their rating of the job he is doing -- have also improved since the fall. Presidents' favorable ratings typically are higher than their job approval ratings. Currently, 51% of Americans say they have a favorable opinion of Obama, up from a personal low of 42% just after last fall's midterm elections. He was last at the 50% level in April 2014. Obama was well-liked in 2008, averaging a 61% favorable rating during the year he was first elected. Shortly before his inauguration in early January 2009, his favorable rating surged to 78%, and his first favorable rating as president was a still-healthy 69%. His favorable ratings, like his job approval ratings, began to slide late in his first year as president. However, his favorable ratings have mostly stayed above 50% since 2009, while his approval ratings have typically been lower than 50%. 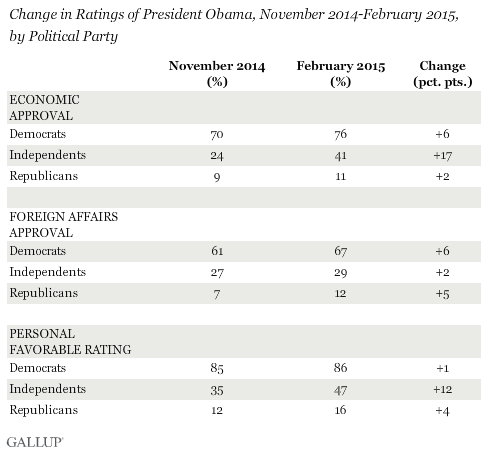 Obama's issue approval and favorable ratings are up at least marginally since November among all party groups. However, independents show much greater increases than the other groups on Obama's economic approval (17 points) and his favorability (12 points). Democrats' ratings on those dimensions were already high to begin with, while Republicans' ratings were and continue to be extremely low. On foreign affairs, each party group showed only a modest increase from November. The 2014 midterms marked one of the lower points in Obama's presidency. This is true in terms of how the public evaluated him but also in the role those lower ratings played in the election outcomes, which gave the Republican Party control of both houses of Congress by healthy margins. Since then, Obama has enjoyed a bit of a comeback, as reflected in his overall approval ratings, his ratings for handling specific issues, and his personal favorable ratings. The improving economy has played a major part in that, as has his plan to use executive actions to address the legal status of millions of immigrants residing in the U.S. illegally. Although the status of those actions are uncertain pending legal challenges, the plan had a positive impact on the way Hispanics view him, and his support among Hispanics remains higher today. If the economy continues to get better, and if the president can successfully address some of the key international challenges, his ratings may continue to improve. Indeed, his recent job approval ratings in Gallup Daily tracking have been about 50% since the Russia-Ukraine cease-fire agreement late last week. President Barack Obama's approval ratings for handling the economy (35%) and foreign affairs (36%) are both significantly lower than his overall job approval rating, which has been the case throughout his second term. For the first time, a majority of Americans (53%) believe world leaders do not respect President Barack Obama, a sharp increase from 43% in 2013. At the same time, they believe the international community views the U.S. favorably. President Barack Obama scores worse today on several economic issues than he did in June, with his approval rating on the economy down seven points to 35%, and his ratings on taxes and the federal budget deficit each down five points.